The human brain has an uncompromising requirement for perfusion unlike any other organs. Disturbances in normal blood flow can result from chronic changes relating to atherosclerosis or arteriopathy (e.g., Moyamoya) or can be acute as in the case of vessel occlusion need to treat complex brain aneurysms. Whether acute or chronic, ischemic risk is the final common pathway. Revascularization, in the form of direct bypass surgery, aims to immediately restore normal blood flow to the arterial territory distal to the lesion, thereby averting ischemia. By matching donor blood vessels from the intracranial or extracranial circulation to the recipient blood vessels, the surgeon has the opportunity to make a dramatic effect on what would otherwise be potentially devastating natural history of the disease. In doing so, there is also the potential for serious complications. 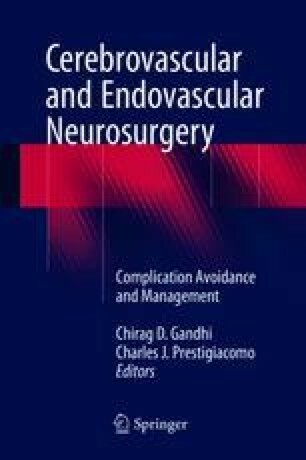 Herein, we describe the principles of direct bypass surgery and review the nuances and techniques for complication avoidance that have accumulated with a personal experience of over 400 bypass operations.